No, no like, "We're warping into mermaid mode". We're talking about the definition that refers to the current fashion. We should really talk about mermaid fashion more often. Those underwater ladies have got it all. They're shiny. They're scaly (in a good oceanic way), and they get to wear two seashells for a shirt! Plus, we don't know anyone else who looks good with seaweed in their hair! The only way we'd get away with that is if we were wearing these gorgeous blue mermaid sleeves. Up your mermaid costume ante with these gorgeous sleeves. 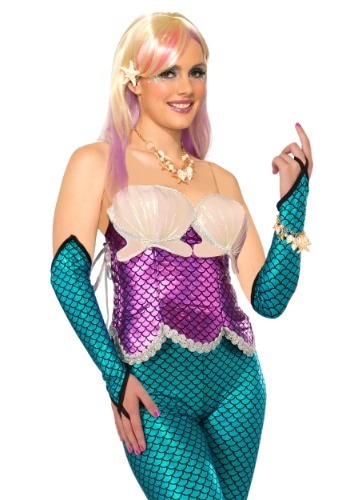 Whether you're simply looking for extra color on your forearms or you wanted to keep warm while you're trying to be "part of their world", you're sure to love this colorful costume. It loops over your middle fingers so it stays put without rotating. You'll also like the pointed hem that lands above the elbow. You'll find that you can bring your new glamorous fishy fashion to amazing places. Whether you pair it with a cute scaly dress or a full-on mermaid ensemble, you'll find that people need a little more mermaid in their lives. Bring out the "dive" in your local dive bar. Or cast a wide net and shop for beachy lawn furniture at Pier One. Your new look is sure to make waves!